Conference organised by Kathryn Thompson, PhD Candidate in the Department of Classics and Ancient History & HRC Doctoral Fellow 2017-18. Apotropaic art, symbols or objects are those which have – or are reputed to have - the power of averting evil influence or ‘bad luck’. The very idea of an apotropaic object stands at the centre of theory seeking to concretise objecthood and materiary power. Apotropaic things are, in their very nature, possessed of an agency that both transcends their status as a material object yet is also inextricably tied to it: their physicality enables them to be purposefully placed in liminal spaces or carried close on the body; the materials they are made from carefully chosen and frequently bizarre or rare; their form, shape and construction often highly specific and closely allied to tradition and ‘folklore’. Therefore, the repellence of forces which are abstract and amorphous relies intrinsically upon the materiality and apparent ‘concreteness’ of specific objects. In turn, the ways in which society, throughout time and across culture, has attempted to reconcile the seemingly dialectical nature of such items stands at an interdisciplinary confluence. 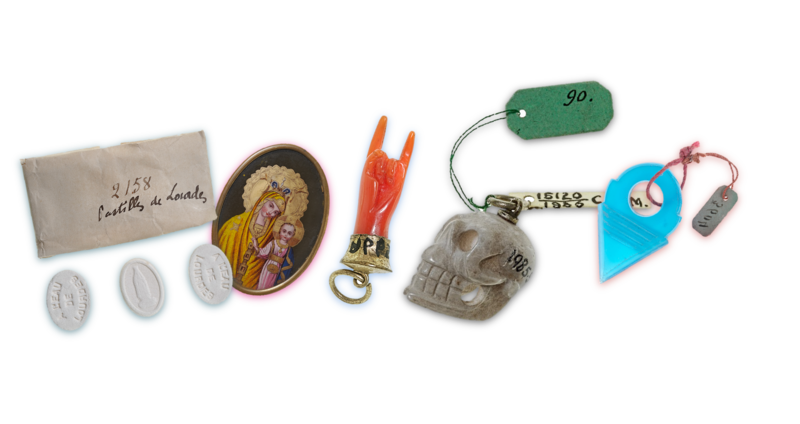 Such objects might include religious icons, jewellery, biological specimens, clothing, funerary equipment, materia medica, portraiture or relics, and their perceived ‘power’ might be grounded in faith, ritual, superstition, biopolitics, cultural memory, memorialisation, consumerism or even medical adherence. In our modern era, the nature of ‘objecthood’ is undergoing great change; ‘virtual reality’ and the rise of virtual museums, online collections, 3D printing, and sensory simulation ensure that objecthood, and our [un]changing relationship with it, is as relevant as ever. Amidst the evolving status of objecthood, do we continue to create apotropaia? If so, where might we identify them? How might we extend this concept to scientific, medical or technological 'objects', if at all? This conference will investigate how recent developments in the study of material religion, neuroarchaeology, semiotics and phenomenology might help us better understand not only such objects themselves, but also their many guises and surprising pervasiveness, as well as our ongoing attempts to typologise and demystify them. Following the conference, we intend to submit proposal to Warwick Series in the Humanities (in partnership with Routledge) for a collected volume. The sorts of present-day ‘objects’ which have 'power' over us, or the sorts of objects we invest with similar/‘equivalent’ ‘power’ today. We also welcome proposals for workshops of between 40-60 mins on particular genres or case studies of material, museum collections or related projects. To propose a workshop, please submit abstracts of no more than 500 words detailing the theme, structure, duration, perceived outcomes including activities/item handling and any specific resources required. Send all abstracts to remarkablethingswarwick@gmail.com along with your name (if more than one for workshops, please give name of all contributors), title/position, and institutional affiliation. Posters on relevant research, projects and ideas - from any range of disciplines - can be displayed for the full duration of the conference schedule, and time allocated for viewing and discussing these will take place during lunch, refreshment breaks and the wine reception at the end of the event. To submit a poster or similar materials for display, please send an electronic copy (for pre-existing posters) OR a 200-word abstract to remarkablethingswarwick@gmail.com by 1st December 2017. Images reproduced courtesy of Pitt Rivers Museum, University of Oxford. Top of Page: 1985.52.33; Bottom of Page, Left to Right: 1985.52.1084, 1985.52.353, 1985.52.2, 1985.52.43, 1985.52.1700; Pitt Rivers Museum, University of Oxford. Gell, Alfred, Art and Agency (1998); Mitchell, W.T. J., What Do Pictures Want (2005); and Pietz, William, The Problem of the Fetish, II: The Origin of the Fetish (1987).